Several years ago, on one of my many trips to Guatemala, a friend and I decided to head to a cooperative we knew about which was located in the city of Solola. This workshop was known for the hand-dyed and woven chenille scarves it produced. My intent was (and I did) to purchase gifts for my nieces and business colleagues. While there, we were also shown a series of small pen and watercolor paintings that an artist had left in hopes of possibly selling a few. For that artist, it was an unlikely venue to do so. Cooperatives like this one do not receive a lot of foot traffic. Typically I wouldn't purchase a jumbo postcard sized illustration. But at the time, I knew that if I did, the money earned by this artist could feed a family for a week. I could make a difference. To this day, I do not know if the artist who created this work is a woman or a man. And this is where my analysis of this artwork began and ended. Until today. Since the time I purchased it, it has been propped up against some books on the shelves of my library. I glance at it often without giving it significant thought. This morning with International Women's Day on my mind, I approached this piece quite differently. All of a sudden I noticed that the woman is standing behind the man. He has a hat. She is not shielded from the sun. Her hoe is embedded in the ground and her head is tilted as she works the field. He holds his tool, but is not actually using it. 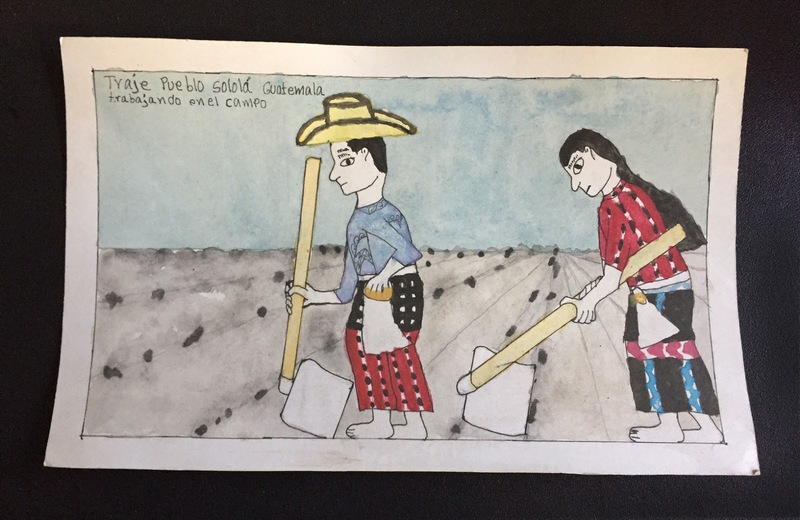 What the painting illustrates to us is the woman is one step behind the man and in this rendition of life in Guatemala, the man is positioned in a superior position. This is a light bulb moment.